The Many Names of 1221 Vine Street : Digging Cincinnati History investigates what is now an Over-the-Rhine parking lot. 3CDC Adds Another Property to Mercer Demolition List: it looks like another historic OTR building is about to bite the dust. The Anti Green Thumb’s Garden: Scoutie Girl remakes her garden using our seed bombs. Pink Balls of Aires Libres – Montreal: this summer, 170,000 pink balls hang over a street as part of the Aires Libres art festival in Montreal. L.A. ‘Street Art’ in South Central at Manual Arts High: amazing story. Four Minutes to Midnight [or 23:56] is an annual experimental literary arts zine edited, designed and published by Montreal-based Kevin Lo and John W. Stuart. The tenth issue explores the idea of radical beauty interpreted through the words and images of over 30 artists, writers and designers, including Cincinnati-based VisuaLingual, who contributed vernacular typography found in Over-the-Rhine. Monopoly has a simple, effective formula that works with varied themes [apparently even the Junior Disney Princess Edition]. 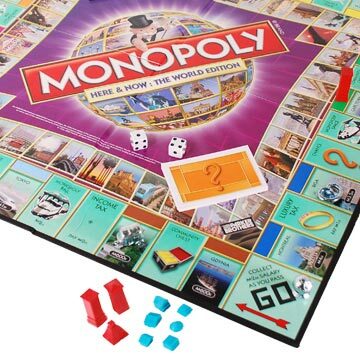 I’ve just learned that, earlier this year, people voted for cities to be included in the new Monopoly Here and Now: The World Edition. 20 top cities were chosen out of the pool of 70, with 2 more earning spots on the board as a result of write-in votes.